In our household we love a great vegetable curry- often so much fresher and more appealing than their meaty counterparts. This curry is quick, easy and low of faff so no excuses for not rustling up a midweek feast! The ingredients here really need to speak for themselves so keep it simple! Of course, if you are a chilli fiend then add a little more here and there to suit your tastes but not so it drowns the sweetness of the squash. I have used spinach which is one of my favourites but this would also work well with kale. Sometimes I like a drier curry and in this case I usually halve the quantity of tomatoes and roast the squash a little beforehand to cut down on the cooking time. Squash which is roasted with some curry spices is delicious! I served the curry with homemade brussel sprout bhajis which are a great twist on the traditional onion version. They are quick to make and they also freeze well (if there are any left of course!). See here for the recipe: http://wp.me/p4O5jd-px. 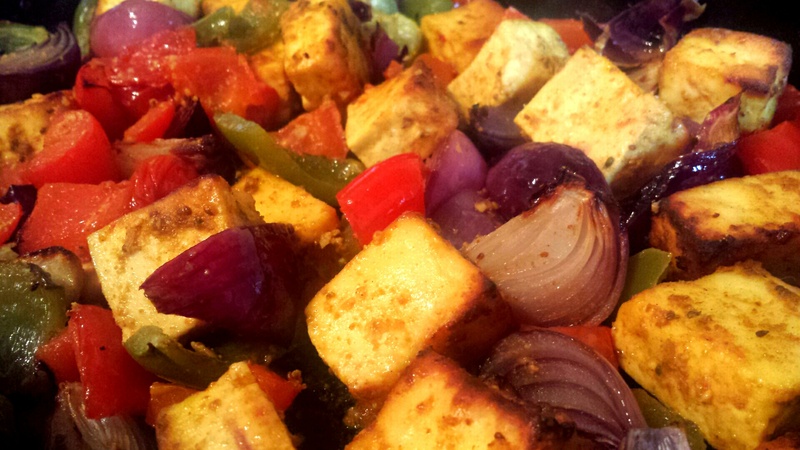 Why not make it part of a vegetarian curry feast and also make a side of paneer shashlik which I absolutely love. Check out the recipe here, it’s so simple: http://wp.me/p4O5jd-j9. 1. Start off by prepping the butternut squash. I will happily admit it, I hate cutting squash but fear not, I have a trick up my sleeve to take the work out of this task! Simply place the squash in the microwave for a couple of minutes, remove and place on a sturdy board ready for chopping The heat will slightly soften the squash and it makes it much easier to remove the skin so give it a try! Remove the skin and cut into bite sized chunks before setting aside. 2. Next, you need to make the curry paste. Add the cumin, coriander, turmeric, garam masala, chilli and garlic to a pestle and mortar with a splash of water and work it until if forms a paste. 3. Heat a small glug of oil in a large pan over a medium heat and fry the red onion for a couple of minutes until softening. Add in curry paste and cook for a couple of minutes until fragrant- keep it moving so it doesn’t catch. In goes the cubes of squash next! Stir well to ensure the paste coats each cube of squash before adding the chickpeas, again, making sure they are well covered. Pour in the tinned tomatoes and bring to a simmer. Cover and cook until the squash is tender and the sauce is thickened. Towards the end of cooking add in the baby spinach and cook until wilted. Serve with your choice of side such as chapatti or simply enjoy it as it is with a final flourish of freshly chopped coriander. 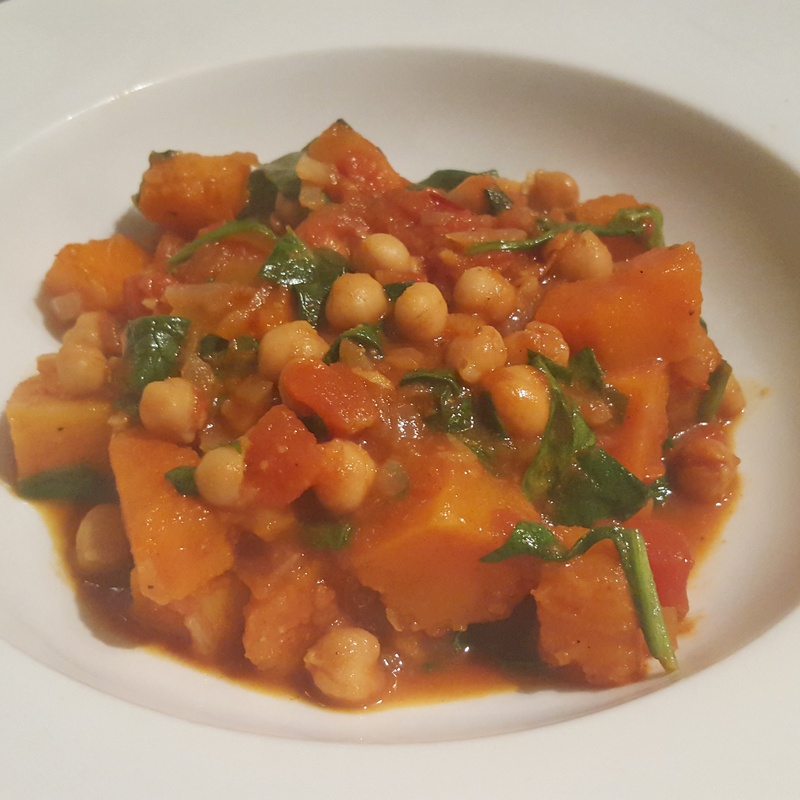 Chickpea, squash and spinach curry- a spicy offering to keep you warm this winter! I have it on good authority that these bhaji bad boys have converted many a sprout hater so you have no excuse to try them! You can always use half of the sprouts and mix with them same amount again of oninon if you need a gentle introduction into the world of all things cruciferous… Serve with raita for a cooling dip. These can be served hot and cold so they are perfect for an accompaniment to a festive turkey curry or as part of a buffet. 1. Shred the brussels before you make the batter. Gram flour is made from chickpea and lends itself to the perfect bhaji. The baking powder gives a lightness so don’t forget it! Sieve the flour into a large bowl before adding the baking powder and spices. Add the water little at a time until you achieve a thick batter before mixing the sprouts into it. 2. Carefuly heat the oil in a pan so it is a couple of inches deep over a high heat. To test if it’s ready, drop a small piece of sprout into it and it should bubble around it before turning golden. Use a couple of dessert spoons to shape the bhaji mix and carefully lower into the oil. The will take a few minutes to fry and remember to turn them halfway through so they colour evenly. Cook around four at a time so the pan doesn’t get overcrowded. When they are ready, remove from the pan using a slotted spoon and blot onto kitchen towel before serving. 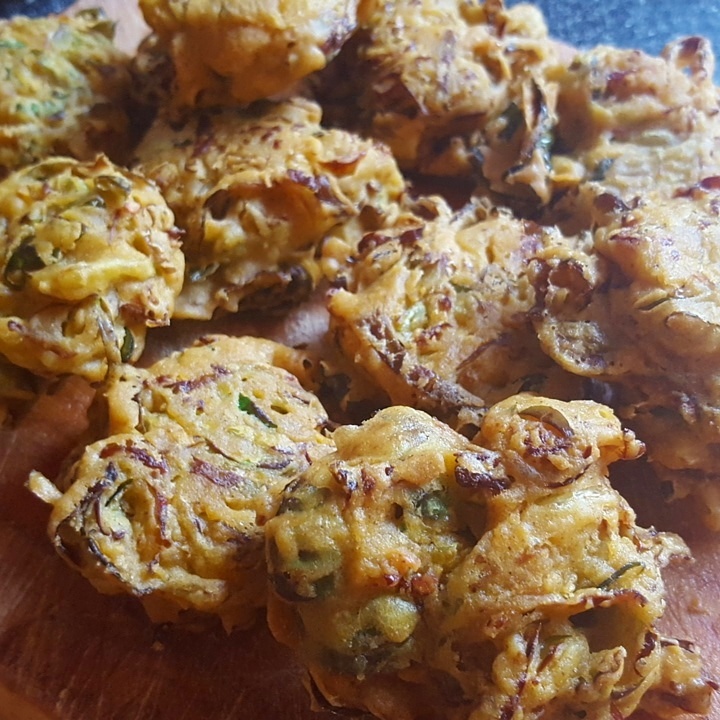 Spicy sprout bhajis- a festive addition to any buffet or curry night!